In 1941, eleven-year-old Macy James lives near the Oregon coast with her father, the director of a small museum. Miss Tokyo, one of fifty-eight exquisite friendship dolls given to America by Japan in 1926, is part of the museum’s collection — and one of Macy’s most treasured connections to her mother, who recently passed away. When the Japanese bomb Pearl Harbor, many of Macy’s neighbors demand that Miss Tokyo be destroyed. When her brother joins the Navy and devastating news from the war begins to pour in, Macy starts having doubts — does remaining loyal to Miss Tokyo mean being disloyal to America? 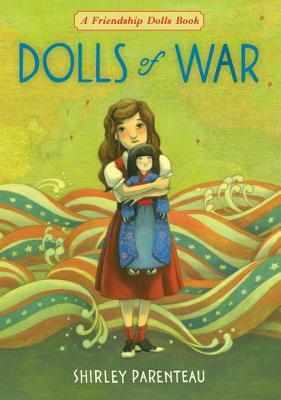 Bringing the story of the Friendship Dolls forward to World War II, Shirley Parenteau delivers another thoughtful historical novel inspired by a little-known true event. This novel moves along with continuous action and a couple of surprise twists. Readers of the Friendship Dolls series will definitely want to read this addition. This would also be a good read aloud for units discussing WWII, Japanese internment, and discrimination in general.